1. Gently crush the raspberries and blackberries with the back of a spoon. 2. 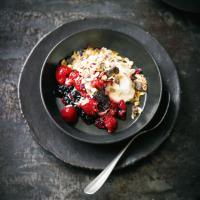 Divide the berries between 2 bowls, pour over the yogurt, top with the muesli and serve.